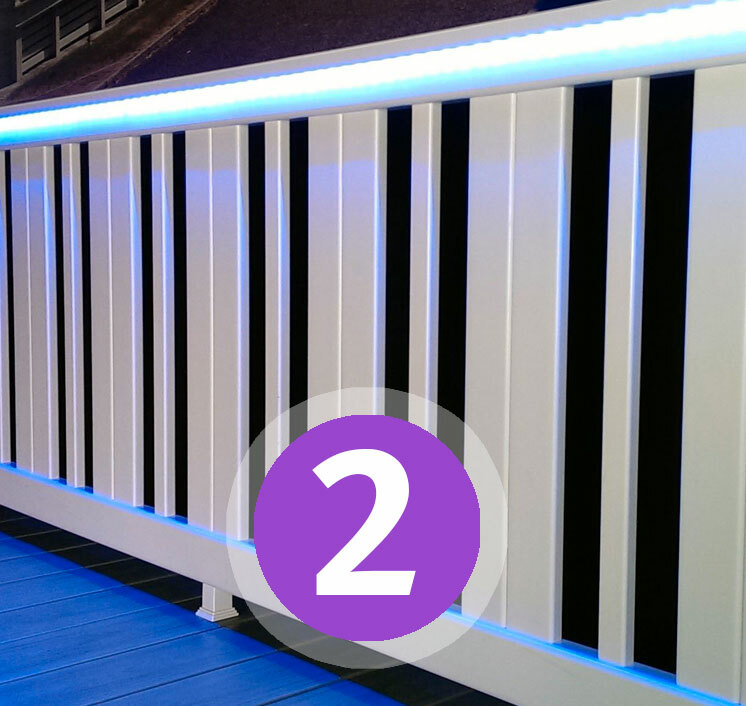 To help you make an informed choice our decking LED lighting review has been produced to explain in greater detail the many benefits of Mayfield products. 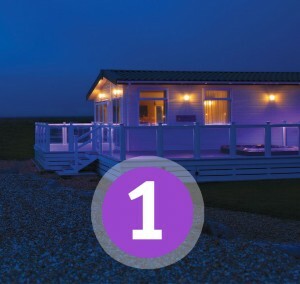 Our review details the research, development and production processes involved in producing a safe, reliable, fully compliant, low energy LED light system for our market leading decking products for static caravans and other holiday homes. Efficiency: Mayfield LED’s produce more light per watt than incandescent bulbs. Colour: Mayfield LED’s emit light of an intended colour without the use of the colour filters that traditional lighting methods require. This is more efficient and can lower initial costs. On/Off Time: Mayfield LEDs light up very quickly. A typical red indicator LED will achieve full brightness in under a microsecond. Dimming: Mayfield LEDs are dimmable. Cool Light: Mayfield LEDs radiate very little heat and are thus less prone to failure. Lifetime: Mayfield LEDs have a long life – typicallly 50,000 to 100,000 hours. Shock Resistance: Mayfield LEDs have solid state components which are extremely robust and can withstand external shock, unlike incandescent bulbs which are fragile. Safe: Mayfield LEDs are low voltage and do not contain mercury. LED is an abbreviation for ‘light emitting diode’. The diodes (or chips as they are commercially known), are small low powered units which omit small amounts of light. However, in multiples they perform excellent light outputs and are super energy efficient. Is there a difference in quality with an LED lighting strip? Yes there is. With LEDs you really do get what you pay for. We have ascertained this ourselves from testing all types of LED strips from around the globe from various manufacturers and narrowing it down to the ones we supply today which produce the best results for light outputs, efficiency and reliability. The Mayfield LED lighting strips use a two-ounce copper core which is higher quality and more heat conductive than cheaper alternatives. This increases the longevity of the product by helping to keep it as cool as possible. Cheaper led strips use less copper making them less expensive to produce, but also more prone to failures due to heat degradation. All of our LED strips use branded Samsung chips (light diodes) – that means that they are produced by world leading manufacturers with strict quality controls. It also means that the chips themselves are more stringently ‘binned’ which is a process of grouping them by colour temperature. On poor quality LED strips you can sometimes see a difference between the colour temperature of the individual chips as you look down them giving variations of light. This is just a result of poor binning practices to reduce costs. 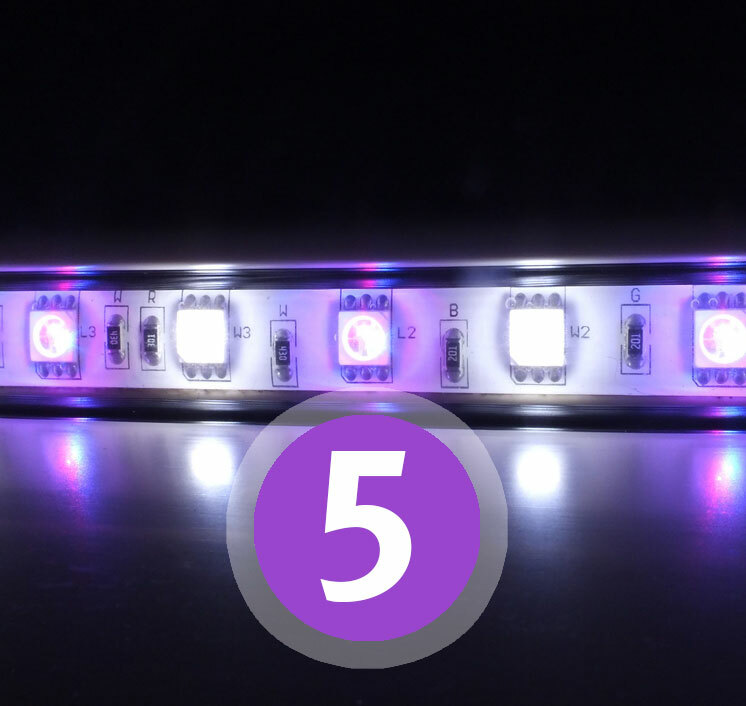 How much light do the LED strips generate? A lot and it is evenly distributed, unlike the light from a conventional post light. Multi-coloured LED strip (commonly known as RGB) varies hugely between manufacturers for light outputs. Mayfield’s RGB LED strip have high-output powered chips in them and from our research have outperformed all other LED strips that we tested. Do they save on electric? Tremendously. A 60 watt conventional Incandescent bulb for example is only an eight watt LED. Both produce around 800 lumens of light output but the LED costs around 15% of the price to run. 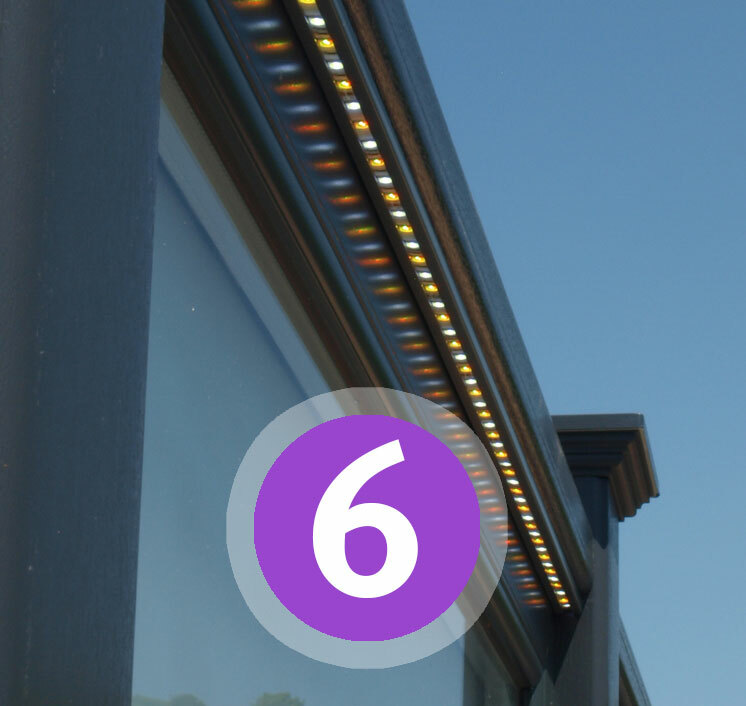 In monetary terms, if you were to light an average size Mayfield sundeck continuously for a year the LED would cost approximately £124, while a conventional 60 watt bulb system would cost £876 (based on current electricity rates). Multiply this by 40 sundecks and this becomes a £30,000 p/a saving, hence another reason LEDs are becoming increasingly popular. It is important when installing any lighting products that the IP rating is suitable for the application. Ingress protection (IP) is an international standard for classifying the degree of protection provided against the intrusion of items such as human contact, dust and water. 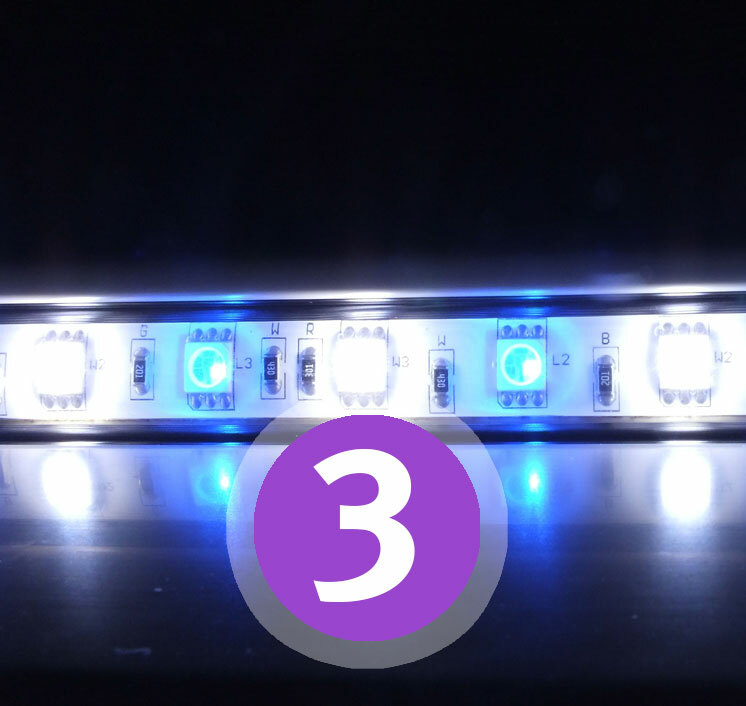 There are generally four types of IP ratings for LED strips. Ensuring that the correct level of protection is used will minimize safety issues and premature failure of the lights. P1– IP20 rated products are for internal use only. They have no protection against dust, moisture, or water. P3– IP65 rated products are suitable for internal or external installation. The luminaire is protected against dust, rain, and low-pressure water jets. IP65 LED strip is coated in a silicone gel. P4– IP67 rated products are the same as IP65 but are also suitable for temporary immersion in water. IP67 LED strips are enclosed in a silicone tube. P5– IP68 rated products are the same as IP67 but are suitable for permanent immersion in water to a depth of 1m. IP68 LED strips use the same silicone tube as the IP67 tape, but it is injection filled with silicone. Mayfield’s supplies both IP65 and IP67 LED strips. The reason for using two types is that a smaller diameter strip is required for our Clearview range (IP65). Both have been specifically chosen to integrate into our unique balustrade systems. All Mayfield LED strip lights are now supplied in RGB as standard and come with a handheld remote control. 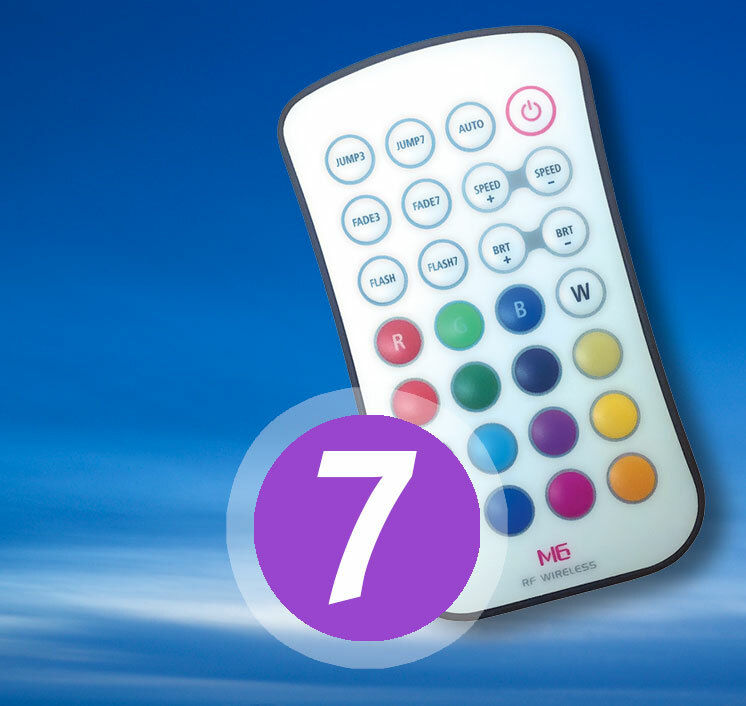 The remote control is simple to operate and is packed with features such as a pallet of 16 colours to change the lighting to suit your evenings mood. The remote control operates on a frequency of 433.92 MHz giving them an effective unobstructed range of between 40-50m. The pairing of the controllers and receivers is done via a ‘learn’ button located on the receiver itself. This matches the controller to the receiver on a specific pre-programmed channel. If you installed several systems in close proximity, although they would be operating on the same frequency, they would only talk to the receiver set to the same channel. The controllers are pre-paired to the receivers direct out of the factory, so are configured ready to go. 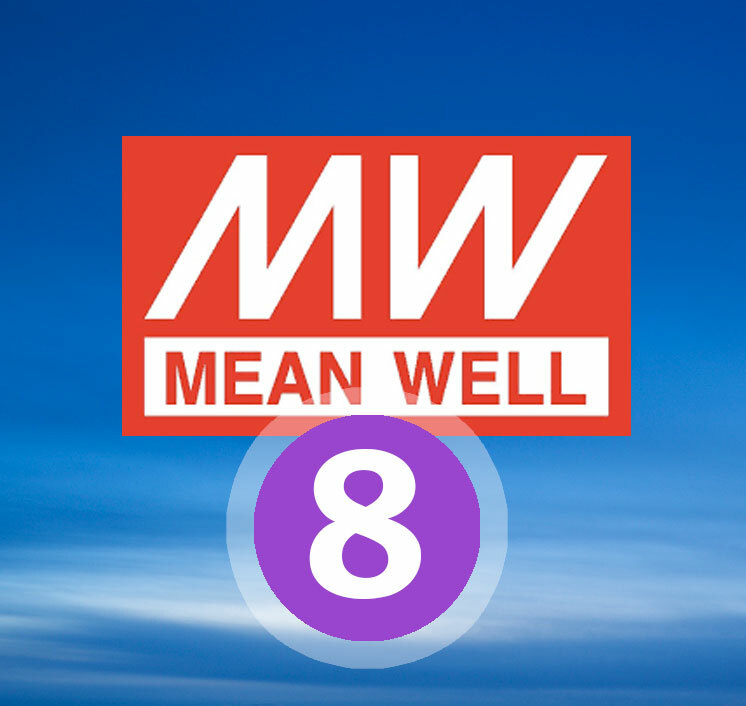 If you ask anyone in the lighting industry who manufacturers the absolute best quality LED drivers, Meanwell is the name that rings out. 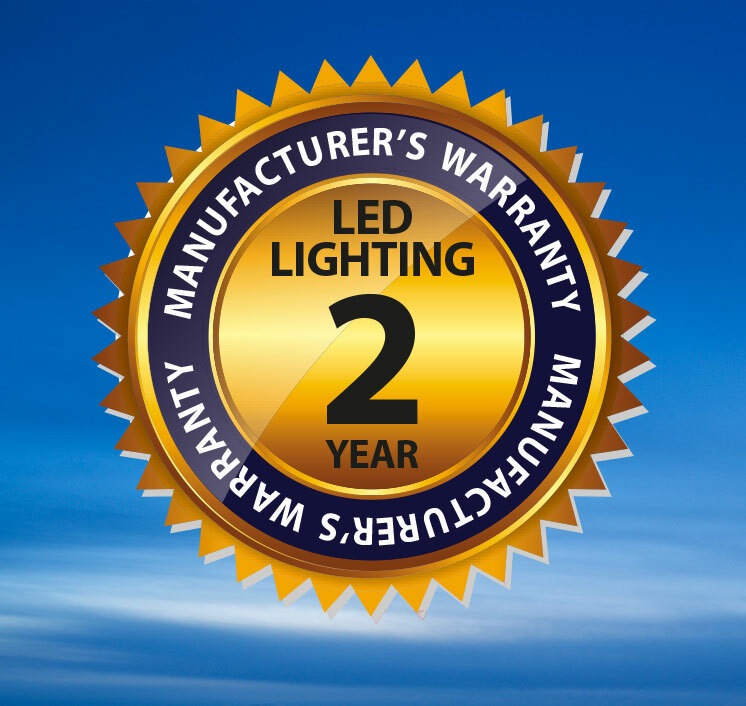 Meanwell drivers are generally regarded at the most reliable LED power supplies available. The models we stock and supply are primarily double-insulated so that you do not require an earth when wiring it. They are also fully encapsulated with a waterproof IP rating of IP67. They incorporate protections for short circuits, overloading, and over voltage, as well as being 100% full-load burn-in tested. We carry a good working stock of all of our core products including LED strips, drivers, and controllers. 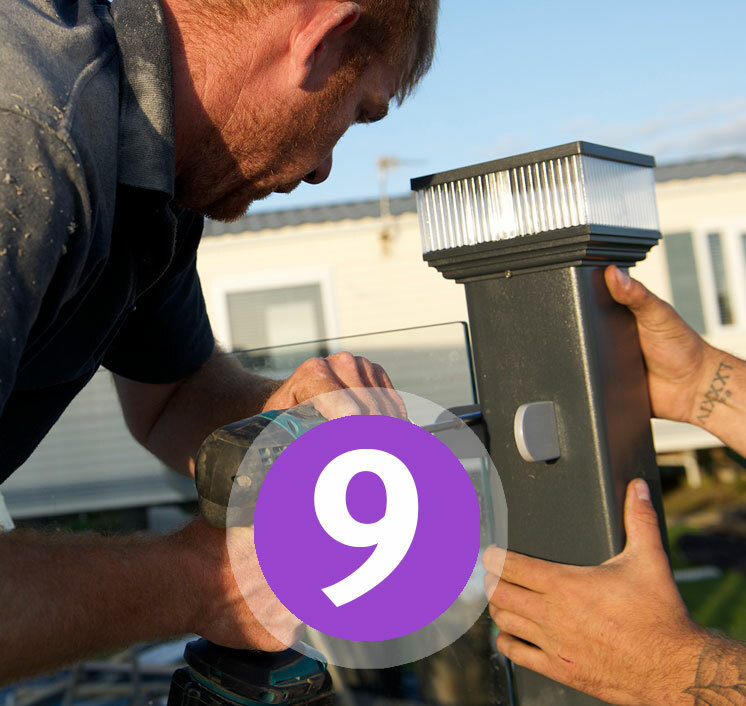 All our national dealers have been fully trained in the installation of our LED systems, offering the complete installation service for LED integration with your Mayfield decking. Mayfield’s Hampton balustrade handrails have been designed specifically for seamless LED strip integration with a cleverly designed concealed track along its underside which houses the LED strip. This unique feature eliminates the strip from dropping which is a common problem seen in our industry. 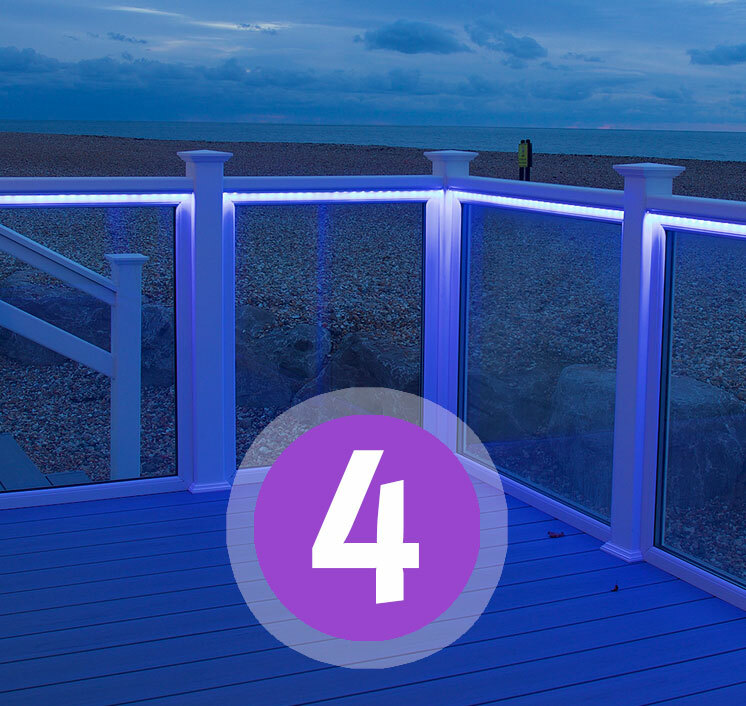 We pride ourselves on unique features such as this, adding to a list of quality features you will only find on Mayfield decking.